Have you ever imagined going a day without water? No doubt you could deal with it at first. But, after a few hours, your thirst would eventually become unbearable. Afterall, they say that you can survive without food for weeks, but without water, you won’t last more than a few days. Simply put, water is life! Drinking plenty of water has many benefits for your body, such as keeping it properly hydrated, improving your mental function, and helping with weight loss. Because of this, experts recommend that you drink 8 glasses or 2 liters of water per day. Despite water being so healthy for us to be drinking, many of us have trouble drinking enough water every single day. Either we just don’t take the time to measure out how much water we’re drinking, or we just end up giving into drinking less healthy drinks such as soda, coffee, or fruit juices. Or, we just simply forget to get in our 8 glasses. Fortunately, people can now use smart water bottles to help them get the recommended amount of daily hydration. Smart water bottles do much more than simply hold your drink; they track consumption, can sync with certain fitness devices such as a Fitbit, and even provide you with reminders throughout the day to drink more water. There are, however, many smart water bottles to choose from. So, with that in mind, I’ve done most of the legwork and have reviewed the best smart water bottle options. To choose the right smart water bottle, you need to understand a number of things. Firstly, you need to consider what you’ll be using your smart water bottle for. For example, if you want a water bottle to take with you while jogging, you might want to look for a model that can sync with a Fitbit or type of other exercise tracker. Secondly, if you spend a lot of time outdoors or in areas with no phone charging points, a smart water bottle with a power bank might be the better choice. Having the additional power bank provides you with an extra power source to charge your phone or smartwatch. The features. The aim is to select a smart water bottle that makes tracking your hydration target easy and guarantees high-quality . The capability of the bottle to hold ample water and reminding the user – you – to take it. This factor is crucial in helping a user maintain their hydration goals and stay healthy all the time. Durability is also essential when picking a smart water bottle. Here, I want to identify the pieces that are durable and guarantee high value for money. The first item on our list is the Hydra Smart Bottle. The device not only acts as a water container, but as I will demonstrate below, it serves a number of other purposes, such as providing you with entertainment on the go. When you first set off for an early morning walk or an evening jog, water is crucial to keep your body hydrated. Fortunately, the Hydra Smart Bottle has a capacity of up to 600 ml (20 oz) of water, which is plenty for a few hours of intense workout at the gym. One thing that people who frequent the gym or go jogging regularly need is entertainment to keep them motivated throughout their exercise. So, for this, the Hydra Tech Bottle has a Bluetooth speaker that plays music from other smart devices such as a cellphone or iPod. And, to make the Hydra Tech Bottle even more impressive, you don’t even need to change the batteries because they are built-in and rechargeable. Simply plug the smart bottle to to a power source to recharge. I was also impressed by this smart water bottle’s lights: white, red, and rainbow. The white light is bright enough to light your way in a dark room. The rainbow color is impressive by helping light up the mood of your workout space. So, even if you are tired after a long day at work, the bottle lights the space with cool colors – red, Ash, and blue, – that are vibrant and trendy. Ultra-safe 4000 aMh polymer power bank: The power bank is designed with a 2.1a universal serial bus (USB) output that allows you to charge the bottle’s Bluetooth speakers and other devices such as a smartwatch. The microphone: When working out on the treadmill or lifting weights, reaching for the phone to record something or to speak can be disruptive to your workout. Fortunately, the Hydra Tech Bottle has a strong hands-free microphone that allows you to speak when exercising or while doing other chores. The bottle is made from hardened plastic: When you acquire the Hydra Tech bottle, rest assured it will last for a long time because it is designed with hardened plastic. Besides, it features a firm clip that allows you to tuck it onto your belt or backpack. This makes it extra convenient to carry around. The smart bottle makes exercising fun with its Bluetooth speakers and special lighting. Its unique design with a lantern makes it possible to exercise or even alert other road users of your presence in dimly lit areas. Its power bank means that you can extend the life of other electronic devices such as a smartwatch. The bottle lacks water consumption tracking capability. Although the bottle does not have the consumption recommendation capability, its other features are pretty impressive. I am especially impressed by the lighting that helps change the mood to your immediate environment to encourage the owner to continue working out. If you are looking for a great bottle that works fine without the water consumption tracking capabilities, I would recommend the Hydra Tech Bottle. If you take a closer look at the common argument that every person should consume eight glasses of water every day, you will realize that it’s inaccurate. Although it’s correct that you should drink a lot of water, the correct quantity to drink is dependent on a number of factors such as your weight, gender, height, and activity level. 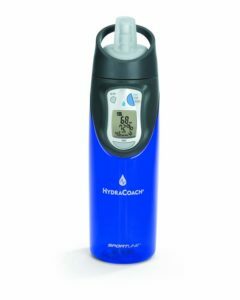 The Hydracoach Intelligent Water Bottle by Sportline is an interactive cup designed to help you calculate personal water consumption needs and feedback on your intake. Note that you will need to first key in your weight using the buttons and display on the bottle’s top section. To get the recommendation for water intake from the bottle, you are required to enter your weight. Then, the bottle uses your weight to calculate your recommended daily water intake. One of the more impressive features of the bottle is that the monitor settings can be customized manually to ensure they suit your situation. For example, a pregnant woman might need different water intake levels compared to an athlete in a higher altitude or a worker in a cool office. When we talk about daily utility devices, one of the primary concerns is how to keep them clean. 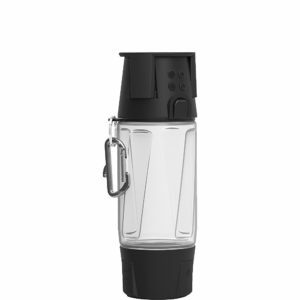 Fortunately, the Sportline Hydracoach Intelligent Water Bottle is designed with a polycarbonate shell that makes it easy to clean either manually or with a dishwasher. Average consumption display: This helps show you your progress towards achieving your hydration goal. Personal hydration calculator: The calculator automatically tells you the amount of water to consume based on your weight. Soft silicone mouthpiece: This is crucial in making it easy to sip the water whether at work or during workouts. Easy to use controls: The bottle has three key buttons: Mode, Setup, and Start/Stop/Reset. Once you set the bottle, it runs on a 24 hours basis and gives your consumption rate in percentage. For example, if the target is taking 80 ounces every day and you’ve already consumed 40 ounces, the bottle will indicate that you have only managed 50%. The bottle is very easy to set up and use based on your personal attributes and goals. A built-in calculator makes it easy to know the right water quantity to consume every day. The bottle is made using BPA-free materials and does not pose any health risks to the user. The bottle does not sync with other fitness devices such as Fitbit. If you are looking for a simple, yet highly effective smart bottle to help you attain daily hydration goals, I would recommend this bottle. Although it doesn’t sync with devices such as your smartphone or other fitness gadgets such as a Fitbit, it’s still a highly reliable piece because of its impressive features such as the consumption display. Is your schedule too tight and you regularly forget to take water and now, you’re worried that your overall health could be affected by this? Then, try the Thermos Hydration Bottle with Connected Smart Lid, which comes in very handy to help you identify your hydration goals and meet them. The bottle is designed with a smart lid that helps connect it to your smartphone. And, when you first buy the bottle, the setup process requires you to enter in your personal details such as your gender and body weight. Then, the bottle will calculate the right personal water intake requirement. The bottle connects to your smartphone via Bluetooth, and shows whether or not you’re on track with your daily hydration goals. Besides, the app helps track your consumption over the course of weeks, months, and years. This serves as motivation to drink more water to you with maintaining better health. 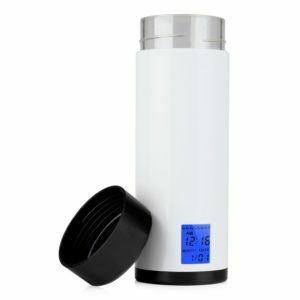 One of the most impressive features of the Thermos Hydration Bottle with Connected Smart Lid is its built-in liquid thermometer. 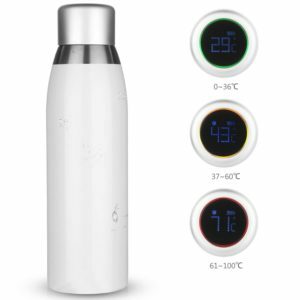 The bottle determines the temperature of your beverage and indicates the quantity remaining in the bottle. This is very important, especially if you want a cold or hot beverage for at work or when you’re away. The lid is also created with a double-locking system; a release button, and a safety clip that helps prevent spillage, even if the bottle falls over accidentally. A lithium-ion rechargeable battery: The battery helps ensure that the bottle is powered to easily sync with Bluetooth and other fitness devices. The hydration charts: These are analytics presented using graphs to demonstrate your progress towards your hydration goals. USB port: The USB port is located at the back of the lid and allows you to easily charge and connect with fitness devices. The following is a closer look at the main pros and cons of the Thermos Hydration Bottle with Connected Smart Lid to help you decide whether it is indeed the best choice for you. The device is easy to use because it it syncs with devices such as Fitbits and smartphones. You can easily establish the personal hydration requirement using the smart bottle’s calculator. The bottle’s battery is very strong and can last for up to 12 days without requiring a recharge. The bottle only works with devices using version iOS7 or later. If you are looking for a smart water bottle that can act as a partner to ensure you hit your hydration goals, the Thermos Hydration Bottle with Connected Smart Lid is a great water bottle that syncs with Fitbit and other devices such as an iOS smartphone. One of the recommendations that medical experts give to people who want to cut weight or remain healthy is to consume a lot of water. Water is crucial in removing toxins from the body, promoting faster cell growth, and preventing other conditions such as headaches, constipation, and diabetes. And, the H20Pal Hydration Tracker bottle is designed to help you meet your body’s hydration requirements. The bottle is created with a curved design that makes it easy to grip and use. The design also features a silicone sleeve that offers additional grip traction for a sturdy feel when the bottle is held while on the move. This bottle operates through a tracking device fitted on the lower side. The tracking device is detachable and enables you to track your water consumption depending on your activity level, the weather, and other personal details such as your height. This sensor works with the H20Pal Hydration tracking app. The hydration tracker is designed for iOS devices such as iPhones. The iOS device syncs with the H20Pal Hydration Tracker sensor to help you calculate your hydration targets and meet them. The unique thing about this app is that it adjusts your goal depending on changes in various parameters. For example, if the weather changes from hot to cold, the amount you are required to drink will go down. The glass bottle container helps to preserve the fresh taste of the water. However, you are advised to avoid using carbonated drinks with it. The hydration tracking device responds to changing personal and environmental parameters. This means that unlike other bottles, such as Hydracoach Intelligent Water Bottle by Sportline, that maintain a constant hydration target, the H20Pal Hydration Tracker bottle alters it to suit the environment. The detachable base or sensor can be used with other bottles without compromising your hydration goals and tracking. The bottle’s sensor and app make it appealing because they respond to personal attributes like height and weather changes when calculating hydration target. The app is very easy to set up and use. The bottle’s tracker can be used with other containers. The bottle is only available for iOS smart devices such as iPhones. However, the manufacturer has indicated that an Android version is being developed. The H20Pal Hydration tracker came out as a reliable bottle that is easy to use in most situations, from fitness through to the workplace. What is especially impressive is that the bottle’s tracker can be attached to other bottles to provide consistent consumption tracking. And, if you find the 18 oz water too little, simply fix the tracker to a bigger bottle as long as the base is three inches in diameter. Because of its unique design and other features such as the highly effective app, I strongly recommend it as the top water bottle that reminds you to drink. Smart water bottles have become the new devices for people who want to live healthy lives by achieving their daily hydration goals. To make their bottles even more impressive, Pyrus went a step further and made sure that its 250 ml (8.5 oz) Smart Cup can keep your water hot or cold. This makes it the ideal bottle for people who carry hot or cold drinks depending on the weather. The bottle is designed with a timer adjustment that is positioned at the bottom section. The timer adjustment sets off an alarm eight times every day reminding you to take water. Note that you can adjust the timer and even snooze the alarm. 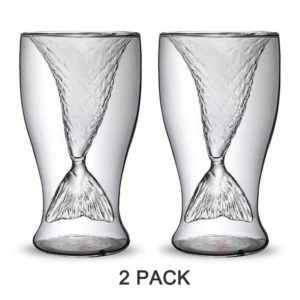 The Pyrus Smart Cup is designed with a double-layer painted glass that helps keep your water cold or hot. If the water is hot, the glass prevents heat from escaping to ensure the water remains hot. The casing is also anti-impact, which helps keep the bottle safe even if it gets dropped from time to time. Intelligent senses technology: This feature helps ensure that you get the right hydration target. The LED screen display: This screen is located at the bottom section and allows you to reset the timer and follow your hydration goals. 2 x AAA batteries: These help power the sensor and run the alarm. However, you will need to change the batteries when they run out because they are not rechargeable. 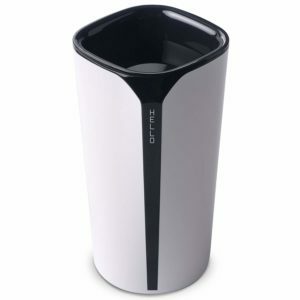 The Pyrus Smart Cup is easy to use. You simply set the bottle to remind you when to take more water. The bottle is designed with food grade Tritan materials, which means it is both safe and reliable to use. 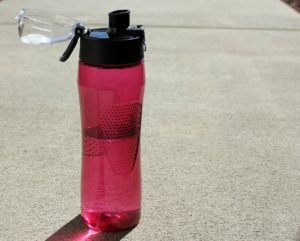 The bottle is unique in that it allows users to keep their water or beverages hot or cold. The bottle only holds about 250 ml (8.5 oz) of water. This implies that you will need to refill it quite often to meet your hydration target. Although this smart bottle lacks any fancy features such as Bluetooth or a microphone like found on the Hydra Smart Bottle, I still found it impressive because of its simplistic design and ability to keep water hot or cold. If you are looking for a cheaper smart water bottle, this is one great option to consider. However, you might need to adjust the hydration reminder to avoid causing disturbances, especially when using a shared office in the workplace. If you’ve been looking for a stylish smart water bottle, the Moikit Cuptime2 could be the answer. Moikit has made a name for itself with its emphasis on products that meet high customer value. Furthermore, the Moikit Cuptime2 is created with unique materials such as eco-friendly premium-Tritan. The materials are also sanitized and made of BPA-free plastic. This helps guarantee users that the bottle can be used without risking the user’s health. Whether you want to use the bottle on a cold or hot day, the material will not denature and release any harmful chemicals into your water. The design of the Moikit Cuptime2 is a culmination of years of research and refinement. When you place the bottle on the table, it looks like a designer cup and helps enhance a room’s aesthetics. The most notable feature of Moikit Cuptime2 is the Moikit app that provides a healthy drinking plan based on your body composition, activity level, and ambient temperature. The app links with the bottle’s sensor so that you can follow the hydration target on your phone. One interesting thing that I noted about Moikit Cuptime2 is that it uses two methods of notifying you when to drink more water. One, the app installed on the phone can remind you the same way a phone alarm works. Two, the bottle also vibrates or emits a beeping sound to remind you when it’s time to drink. An accurate temperature sensor: This feature helps warn the user when the water is too hot or when it’s at the right temperature to drink. Compatibility with most fitness devices: Moikit Cuptime2 stands taller than others on this list such as the Pyrus Smart Cup in that it syncs with most fitness devices. It is an ideal water bottle that syncs with Fitbit, Jawbone, and Apple Healthkit. The wireless charging ring: Moikit Cuptime2 development team believed that one of the crucial components of designing an electronic device is having a perfect charging experience. This is why they designed the wireless charging ring that makes charging easy and fast. The bottle is easy to use whether on its own or together with a smartphone. The Moikit Cuptime2 is compatible with most operating systems such as Android and iOS. The impressive design of the bottle makes it possible to carry it everywhere, including high-end meetings. This ensures that nothing can come between you and personal hydration goals. The bottle is expensive. At Amazon, the cost is $163.83. However, the cost is justified in that you get a premium bottle that guarantees high customer value. The Moikit Cuptime2 came out as a highly reliable bottle by synching with most fitness and health devices out there. I enjoyed the fact that I could use it on my favorite Apple Healthkit on weekends and Fitbit when working out on the treadmill after work. The Homecube Intelligent Induction Drinking Cup is an amazingly designed bottle that comes with incredible features such as a long-life battery and is even sold at an affordable price. Note that, unlike other companies, the Homecube package comprises of two separate water bottles. So, if the place you’re visiting might not have a supply of clean water, consider taking both cups along with you. The bottles are designed using non-toxic materials that make it safe for water use without the risk of contamination. Homecube even opted to use heat-resistant borosilicate glass to help keep the water hot or cold depending on the user’s preference. The bottle reminds you to take water every two hours. It uses a remote sensor that allows you to set the alarm intervals by simply pressing a button on the handle. Batteries to power the sensor: Unlike other smart water bottles that require a daily recharge, the batteries used on the Homecube Intelligent Induction Drinking Cup can last up to two months. 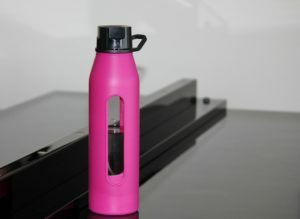 The bottle is available in four color variants: You can go for pink, blue, orange, or green depending on what looks stylish and matches with your lifestyle. The temperature sensor: The sensor is located at the handle together with the remote sensor. If you are carrying a hot beverage such as coffee, the sensor warns you of the temperature to avoid burning your mouth. The Homecube Intelligent Induction Drinking Cup is very easy to use by simply pressing the remote buttons on the handle. Unlike other bottles that are designed for carrying water only, this 400 ml (13.5 oz) bottle can be used to carry any beverage including hot tea and coffee. The battery used on the bottle can last a long time. This gives you peace of mind that the sensors will work correctly during the two months before a replacement is needed. The bottle cannot sync with Bluetooth or other fitness devices such as Fitbit. Homecube came out as an impressive bottle because of its unique features such as the temperature sensor and long-life batteries. However, it lacks other key features such as Bluetooth capability that are present in other premium bottles such as the Moikit Cuptime2. Despite the shortcomings, I would strongly recommend this bottle for those who want to take more water on a budget. At times, all one needs to improve their mood is to drink more water. This sleek water bottle might be all that you need to achieve your personal health goals, and thus, a good mood. The Hydrate Spark smart bottle is designed to make reaching your hydration goals easy and fun. The main component that makes the bottle stand out from others is the hydration tracker. This helps you set your drinking goals and the bottle regularly sends you reminders telling you it’s time for a drink. To make the reminders more impressive, they are available in six variants to help lighten the mood. The bottle can glow white, pink, blue, green, black, or purple to alert you of when it’s time to drink. I found the Hydrant Spark app very interesting because it operates effectively with the low energy-Bluetooth of the bottle’s hydration tracker. In addition to getting alerts via the app, it also helps store your hydration history. It’s also very impressive because it syncs well with other top devices such as Android phones, iOS devices, Fitbit, MapMyFitness, and Under Armor Record. The Hydrate Spark Smart Bottle is easy to use because of its unique design and easy synchronization with most devices, including MapMyFitness and Under Armor Record. The sleek design makes it easy to hold the bottle and consume more water, whether on the go or at the workplace. 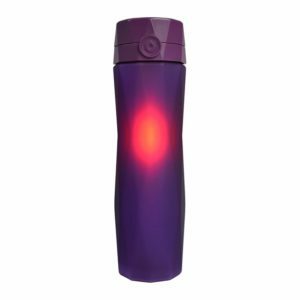 The bottle is designed to remind you to drink more water by glowing in impressive colors. The reminders can also be sent via phone to ensure you never forget to drink water. The bottle is expensive. However, the cost should not tip the scales against it because it comes with a range of top-of-the-line features such as compatibility with most devices such as Android and iOS smartphones. The Hydrate Spark smart bottle came out as a stylish and reliable option to help you meet your hydration goals easily. The bottle’s capability to sync with fitness devices has made it stand out from others such as the Thermos Hydration Bottle with Connected Smart Lid that only works with iOS devices. When you read through most of the water bottles discussed in this list, their volumes range from 250 ml (8.5 oz) to 750 ml (25.4 oz). Generally, the smaller the bottle, the more you’ll have to regularly refill the bottle to maintain your hydration goals. 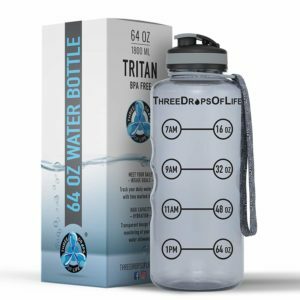 The answer to the above question is the Three Drops of Life 64oz Hydration Tracking Large Sports Water Bottle. This is one of the largest smart bottles on our list and can hold up to 1800 ml (64 oz) of water. Therefore, you won’t need to keep dashing from the gym or workspace to refill your bottle. The design of the bottle features consumption trackers marked directly on the bottle. The bottle is marked from the top (the point where the water level should be after filling it). Subsequent marks indicate where the water level should be at 9 AM, 11 AM, and 1 PM. Therefore, you’re supposed to drink and ensure the water levels hit the marks for the different time frames until it is empty. The bottle is designed with Tritan and BPA materials, which are non-toxic. Additionally, the bottle is very strong and transparent to make it easy for you to see through and tell whether your hydration goals are being met. The large size bottle: This large size bottle makes it possible to hold more water to meet your hydration needs. Fitting cap: The top is used to securely cover the water and make drinking water easy whether at work or in a gym. It fits well to ensure that your water will not spill, even if the bottle falls over. A safety rope: The rope is permanently fixed on the neck of the bottle to allow you to hang it on your wrist when working out. This ensures you don’t drop your bottle. The large size of the bottle makes it easy to carry more water, especially when working away from clean water sources. The design of the bottle is simplified to make it easy to follow. Simply check the marks and try to reach them at the inscribed time. The bottle is very cheap. At only $32.95, you can afford to buy it and use it to achieve to your hydration goals. The bottle is very large and does not fit in standard cup sizes. It does not sync with other smart devices such as a smartphone. I found this bottle very reliable because of its extra large water container. I was able to stay for a full day with this bottle without requiring a refill. Despite this, I found it less impressive because I had to keep looking at the bottle to know where the water level had reached. When people search for smart water bottles, they often wonder whether it’s possible to achieve more than just their hydration goals. Now, the Smart Water Bottle Cup is designed to help you consume more water, keep beverages hot or cold, and can even remind you when to take medicine. The bottle is created with a vacuum container that keeps your water hot or cold. The vacuum seal helps prevent the water from losing heat so it remains hot when you want to use it. On the other hand, if you pour in cold water to use on a hot day, the vacuum prevents heat from getting through and warming it, thus, keeping it cold. The bottle is intelligent and uses its sensor to track your water intake. The sensor uses a battery to display the temperature and set your hydration targets. You can also monitor your hydration progress and temperature by using a smartphone. Professional leak-proof seal: This is an important component of the bottle that ensures your water or liquid will not spill even if the bottle falls over. This means that even if you place it next to items such as paperwork, there’s no risk of getting them wet. Wireless charging system and long battery life: This water bottle uses a wireless charging system and its battery can last up to 24 hours. Stainless steel design: To guarantee users high-quality and durability, this bottle is made using stainless steel. The stainless steel also makes it easy to clean and store. The bottle is very easy to use either on its own or with a smartphone using its Smart Water Bottle Cup App. The bottle is designed with strong materials that guarantee high quality and durability. The design of the bottle makes it easy to use with water, coffee, and even juices depending on the beverage you want to carry. The alarm used to remind you it is time to drink water can also be used for other notifications such as when to take medicine. The water bottle only holds 500 ml (17 oz). This means you might need to refill regularly before a workout session is over. This Smart Water Bottle Cup is a good option for those who want a simplified container to remind them when to take their water regularly. Its ease of use and compact design also make it a great option for those who want to regularly carry around in activities such as hiking. When you set out looking for the ideal smart water bottle, it’s important to think about the the features you need. Here, the aim should be looking at the smart water bottle from the viewpoint of your lifestyle. The following is a guide on selecting the right smart water bottle for you. This is probably the most important factor in determining the ideal smart water bottle for you. If you want a smart water bottle to help you remember when to take water, consider going for a model that uses multiple notifications such as sound, lights, and vibrations. As more companies enter the market to cash in on the growing demand for smart bottles, picking the right one can be a Herculean task. Therefore, it’s advisable to only consider buying from the brands that have demonstrated their commitment to quality. If you can read what those who have already used the smart bottles have to say, it will be very easy to separate the good and bad products. You should also read a few smart water bottle reviews to get expert advice on the best bottles to buy. Do you have other devices that you want to sync with smart bottles? If the answer is “yes”, it’s important to pick a bottle that can sync and work with your specific devices. Here, you might need to be more specific. For example, if you have an iPhone, the bottle should be able to sync with iOS. If you are on a budget, it’s advisable to look for a smart bottle that matches your cash. Remember that this does not simply mean picking the cheapest option out there. Rather, you should go for a bottle with top features, like being able to track your hydration, that is offered at a lower price. Or, for example, consider shopping when stores are having clearing sales. To address the complexity associated with calculating the actual amount of water you need to take, this analysis demonstrated that going for the recommended eight glasses a day is not always enough. The solution is getting a smart water bottle that helps you calculate your specific hydration goals and achieve them. The comprehensive analysis of the top 10 smart water bottle options on the market provides a reliable solutions to your hydration problems. Note that the bottles discussed above cut across a wide spectrum of features and prices to ensure you will not miss out on finding a match for your lifestyle. To pick the ideal option, make sure to follow the comprehensive guide to buying the top smart water bottle for you. You should particularly be critical about the features of interest to you. For example, you should go for the best Bluetooth water bottle, if you want to use Bluetooth during your workouts or at home. No matter the reason why you want a smart water bottle, make sure to only go for the best.